Our objective: finding and managing the home or property you are looking for, whether for sale or rent, with a fully guaranteed service. Only a great company can trust great professionals. Finques 3 Cases first opened in 2000 in Andorra with the firm intention of covering one of our society's basic needs, finding a home. 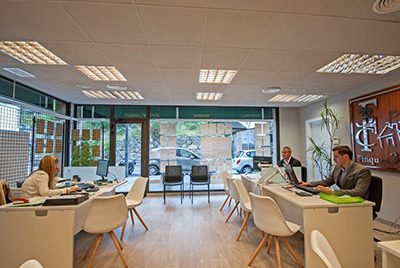 With this in mind, Mr. Joan Rafel Socías and Mr. Narcís Socías, created a real estate agency with its own seal and work style, in which professionalism with clients and environmental friendliness are the two main focuses. Over the years, Finques 3 Cases has achieved significant expansion, making new alliances along the way which enable us to offer a global real estate service. After many years of hard work, we have obtained sound knowledge of the real estate market both in Andorra and in Catalonia, and decided it was time to become personally involved in a project of our own. So we decided to create Finques 3 Cases, with the firm intention of providing our clients with a good service and integrating within one company all of the experience we accumulated over the years, which would then go on to create a group of companies. This level of integration in our environment and the spirit of achievement which makes us stand out from the other companies in our sector, have allowed for Finques 3 Cases to become an established project with a recognised brand in just a few years. Now that we have established our real estate management and advice services in Andorra, and with new objectives established for the coming years, we can state that we have undoubtedly achieved our objective of establishing Finques 3 Cases as a solid company, well-established on the market and highly committed to society.